Buying individual stocks carries unique risks. Sometimes, poorly-performing companies have no choice but to cut their dividends to try to preserve cash flow. This is arguably the worst outcome for dividend growth investors, which is why it is so important to conduct thorough research before buying individual stocks. Fortunately, investors can mitigate this risk by focusing on stocks that have a long track record of increasing dividends. A long history of dividend growth indicates a company with a strong business model and durable competitive advantages that can help it pay its dividend in good times and bad. For example, the Dividend Achievers are a group of 264 stocks that have increased their dividends for 10+ years in a row. This list of Dividend Achievers is diversified across market sectors, and includes three stocks with the financial strength to continue raising their dividends for years to come. J.M. Smucker is a large food and beverage company. Its core brands include Smucker’s, Folgers, Jif, Crisco, Pillsbury, Hungry Jack, Café Bustelo, and Bick’s. It also has pet food brands including Meow Mix, Milk-Bone, Kibbles ‘n Bits, and 9Lives. 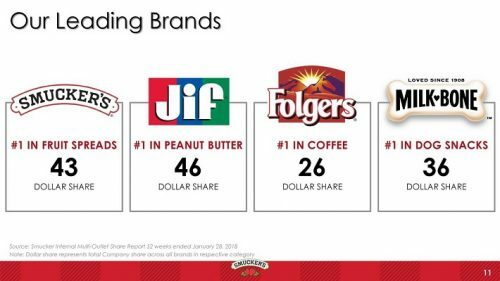 Four of its core brands—Folgers, Jif, Smuckers, and Milk-Bone, each hold the #1 market share position. These strong brands have provided strong growth for the company over the long-term, even when operating conditions become challenging. This was the case last year, as the company reported a 5% sales drop and 11% earnings decline in fiscal 2017. Rising costs of raw materials weighed on the company’s financial performance for the year, but J.M. Smucker quickly bounced back. The company’s sales were flat in 2018, while adjusted EBITDA and free cash flow increased 2.0% and 3.4%, respectively. The fiscal 2019 first quarter was even better, as the company reported 9% sales growth and 18% adjusted earnings growth. J.M. Smucker’s long-term growth potential is still intact, thanks to its powerful brands. In addition, its strong cash flow allows the company to invest in new product development and marketing. J.M. Smucker has exposure to several growth categories, such as pet food. According to J.M. Smucker, the pet food industry is growing by 4% a year. Milk-Bone is a top brand in the pet food category, and J.M. Smucker’s exposure grew even more with the $1.7 billion acquisition of Ainsworth Pet Nutrition. Approximately two-thirds of Ainsworth’s annual sales are derived from its Rachael Ray Nutrish brand, which enhances J.M. Smucker’s position in the premium pet food market. J.M. Smucker has increased its dividend for 17 consecutive years, and the stock has an attractive dividend yield of 3.1%. Combined with 5% annual earnings growth and 5% returns from an expanding price-to-earnings ratio, J.M. Smucker’s total annual returns could exceed 13% per year over the next five years. Texas Instruments is a technology company, operating in the semiconductor industry. Its business model is to manufacture chips, which it sells primarily to the industrial and automotive industries. Its core products are analog and embedded processing components, which account for more than 80% of the company’s annual sales. Its focused portfolio is the result of a major change in strategy several years ago. Texas Instruments went all-in on analog and embedded processing, while exiting categories such as wireless chips, where it could not establish a dominant market position. The results of the transition were excellent. Texas Instruments grew free cash flow by 13% per year since 2004. Its strong free cash flow has allowed Texas Instruments to reward shareholders with share repurchases and dividends. Texas Instruments has increased its dividend for 14 years in a row, including an impressive 24% increase in September 2017. Texas Instruments also dedicates significant capital to share repurchases. The company has reduced its share count by 42% since 2004. 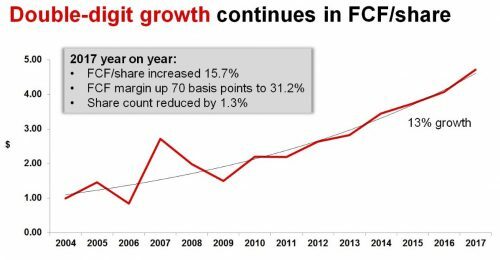 High dividend growth and share repurchases should continue going forward, as Texas Instruments has access to high-growth markets. The company grew revenue and operating profit by 9% and 16%, respectively, in the most recent quarter. Growth came from both core operating segments. Revenue increased 12% for analog processing, and 9% in embedded processing. In the past year, Texas Instruments generated free cash flow of $5.7 billion, a 42% increase from the previous 12-month period. It returned $5.5 billion to shareholders in the past four quarters, consisting of $3.2 billion of share repurchases and $2.3 billion of dividends. The company’s strong growth should allow Texas Instruments to raise its dividend by 10% per year going forward. Texas Instruments stock has potential for strong returns over the next five years, due to earnings growth and dividends. Annual earnings growth of 10% to 11% per year, plus the 2.3% dividend yield, can offset a 2% annual headwind from a declining valuation to generate total returns of 10%+ per year. FedEx Corp. is a transportation and shipping giant. It offers a variety of services including transportation, e-commerce, and business services. FedEx generates more than $65 billion in annual revenue, and the company has a long track record of delivering strong growth to investors. For the most recent fiscal quarter, revenue increased 10% to $17.3 billion. By segment, FedEx generated revenue growth of 9% for Express, 12% for Ground, and 16% for Freight. For the full fiscal year, revenue increased 8.6% to $65.5 billion. Adjusted earnings-per-share increased 27% for the year, due to a combination of revenue growth, tax reform, and share repurchases. FedEx has a long runway of growth up ahead, due to the strength of the e-commerce industry. Consumers are taking their shopping online, which has negatively impacted brick-and-mortar retailers, but shipping companies like FedEx are among the biggest beneficiaries. The company expects 9% revenue growth and approximately 13% earnings growth in fiscal 2019. This growth is fueled by FedEx’s durable competitive advantages. As one of the two major shipping companies along with UPS, FedEx operates in what amounts to a duopoly. FedEx continually invests in its fleet and operations, to secure its competitive advantages and generate growth. FedEx invested $5.7 billion in capital expenditures in fiscal 2018, and expects to spend a similar amount in fiscal 2019. FedEx has a relatively low current dividend yield of approximately 1%. However, it is a high dividend growth stock. The company has increased its dividend for more than 10 consecutive years, and it delivered a 30% dividend increase on June 11th. FedEx should be able to generate 10% annual earnings growth, assuming the global economy avoids a major recession over the next five years. Combined with 3% annual returns from an expanding price-to-earnings ratio and the 1% dividend yield, total returns could reach 14% per year.